i was scared to watch it. terrified in fact. will they do the book justice? check out my review for them! so the Okay? Not Okay tissues were given to us for the preview screening. that hardback signed copy of tfios when it came out and my cinema ticket for today. 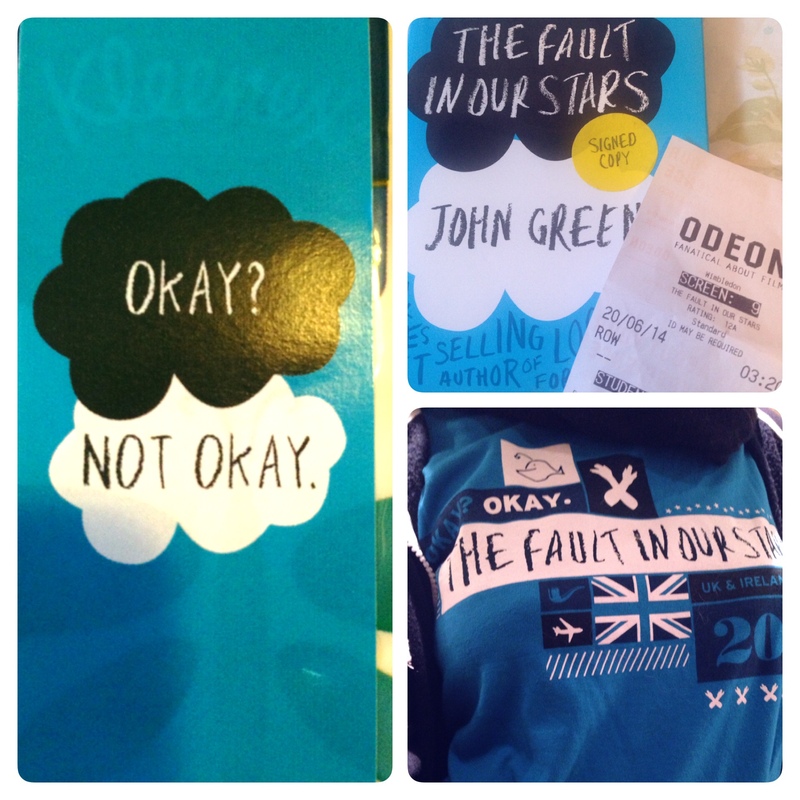 the shirt is the tfios tour shirt when John and Hank Green came to the UK in 2013. Firstly, hazel is just one of those characters who is likeable. like she isn’t so annoying you want to knock some sense into her you just wanna give her a hug and hold her hand and watch American’s Next Top Model with her. Augustus Waters is a pretentious douchebag nerd but you gotta love him. it’s a metaphor. oblivion. leaving a mark. yes we know…but if you read the book you will understand everything about his character and why he is the way he is. Isaac is a brilliant character but i felt he didn’t get enough screen time. Natt Wolf was brilliant as Isaac especially the egg scene. Hazel’s parents are wonderful and i the movie they are just really nice and i felt so bad for them. they kept most of the quotes which was good. i loved the moments between Hazel and Gus when they’re falling in love. the song Tee Shirt by Birdy captures it perfectly. and the game scene with hazel and isaac when he says ‘hump the moist cave wall’ was also cut out. and Troye Sivan wrote a song called the fault in our stars a while ago and he released a lyric video for the extended version and urgh i cried. yeah buzzfeed made a list on why you shouldn’t see the movie. i totally agree. i also got my mum to read it and she defo wants to see the movie. EVERYTHING HURTS. ESPECIALLY MY HEART. WHY JOHN GREEN WHY. GO READ THE BOOK IF YOU HAVEN’T ALREADY!!! thank you for writing such a beautiful book and thank you Josh Boone for directing such a beautiful film.